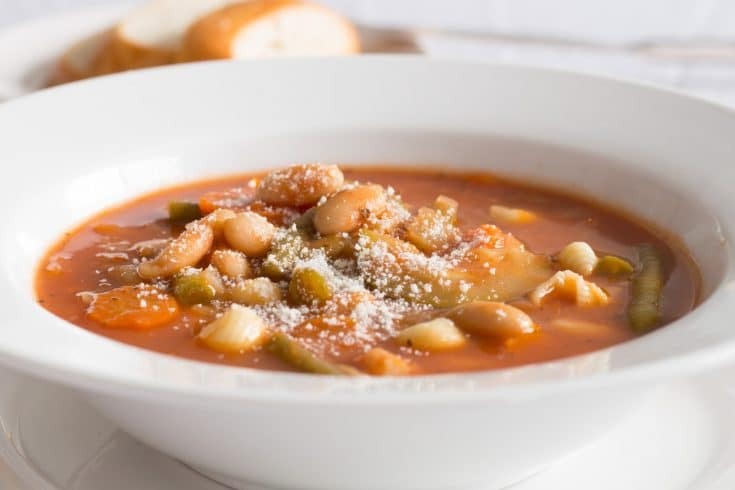 A simple quick recipe for minestrone soup starts with a tomato sauce and broth base and is filled with fresh vegetables and beans. 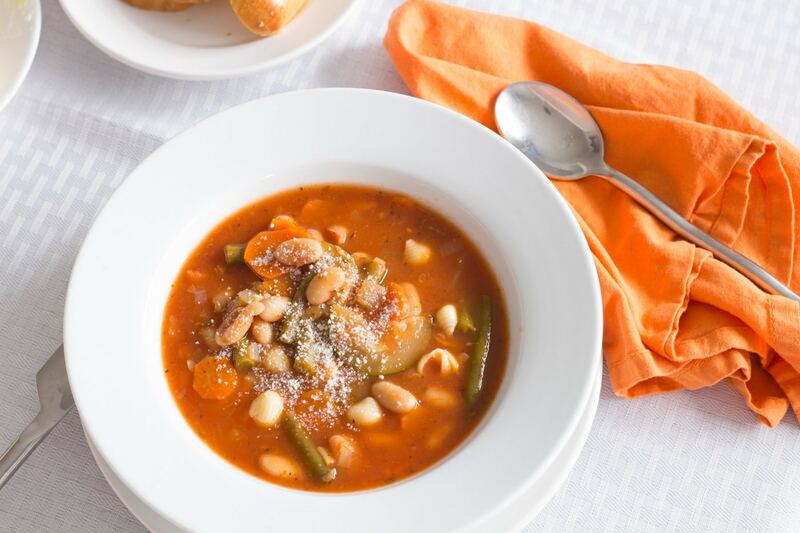 Minestrone is a thick Italian vegetable soup that’s light, loaded with fresh summer vegetables, and has a short simmer time so it doesn’t heat up the kitchen. 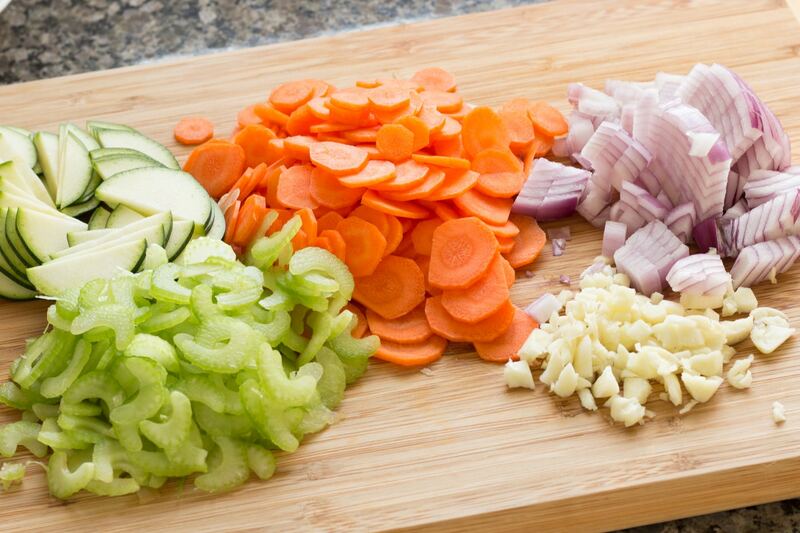 We only use garlic, onions, celery, carrots, zucchini, and green beans for minestrone recipe. Of course, there are tomatoes in it, but they are not chunky. It starts with tomato sauce instead of canned tomatoes. Spinach makes an appearance on occasion, but not as often as it probably should, we need to be eating more vegetables. Just about any vegetable can be added to Minestrone soup. Originally this soup was made with whatever vegetables were seasonal. It has been called poor man’s soup by some and even Italian peasant soup by others. With names like that you can be sure that tons of spare veggies went in! Some suggested vegetable additions; diced potatoes, hard winter squash like butternut, fresh garden tomatoes, cherry tomatoes, cabbage, or kale. Kale is great in the soup since it holds its shape and crunch much better than spinach. Minestrone can be made with zucchini, without spinach, and without just about any other vegetable you don’t care for. Canned beans are what I use in my soup. One it’s convenient, and two I can be lazy at times. I also use the liquid from the beans to add more liquid to the broth. Using dry beans in this recipe requires pre-cooking of the beans. Don’t try to cook any dry beans in the minestrone, it will take like a million years and soak up all the broth. 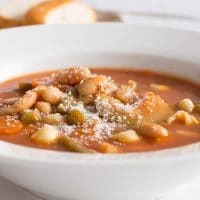 Cannellini beans are my favorite bean for this soup. Cannellini beans are just white kidney beans so light and dark red kidney beans would be my second choice. Navy beans and Northern beans are a couple of other white beans that would be great. I prefer to use small pasta shells. Small elbow macaroni, pipettes, and ditalini are also fine choices for this soup. In a pinch acini de pepe or orzo could also be used. Be mindful of the cooking time for the pasta. Orzo can take a lot longer to cook than small shells. I cook my pasta separately from the soup and add pasta to individual bowls before adding the soup. Cooking the needles separately keep the pasta from becoming overcooked and mushy. Keeping the pasta and the soup separate also keeps the pasta from getting overcooked during reheating. 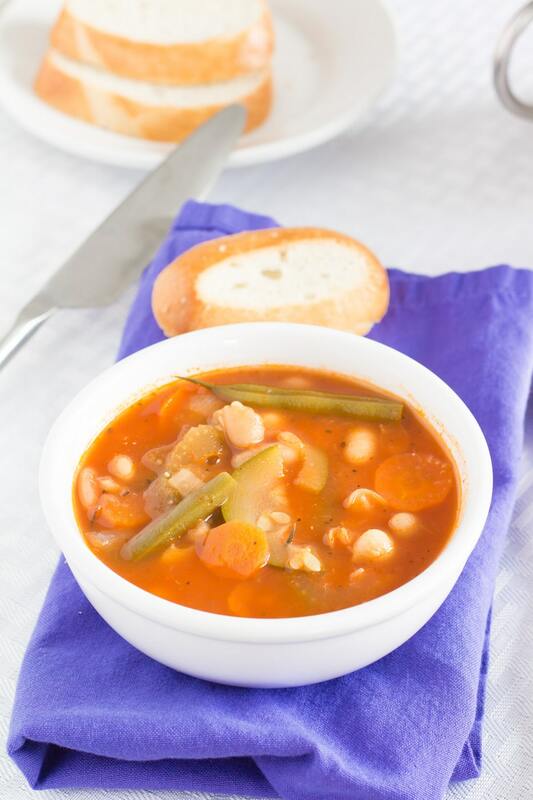 Minestrone can be made without pasta. Just omit it from the recipe. Omit the cheese on the top or use a vegetarian cheese for the top. Parmesan cheese is not vegetarian, it contains some enzymes that are not vegetarian. Substitute the chicken broth with vegetable broth. Most dried pastas are vegetarian but check the ingredient list to make sure that the pasta does not contain any eggs. Substitute the pasta called for in the recipe with gluten-free pasta. DO NOT cook the gluten-free pasta in the soup! It will disintegrate. Instead, cook the pasta separately and place the cooked pasta into a soup bowl and top with hot soup. If the gluten-free noodles are going to be hanging out for a bit, it really needs to be coated with either a bit of the soup and stirred to prevent sticking or coated with some olive oil. When I say a bit of the soup, I mean just enough to coat the pasta not enough to continue cooking the pasta. Gluten-free pasta is easy to overcook. It’s best if the noodles are used immediately and eaten while the noodles are hot. Check the ingredients listed on the chicken broth. A few of them out there have added gluten to it. I’m not sure why, but it is in there. I use the ones actually labeled as gluten-free whenever I am serving this soup for gluten-free guests. I’ve mentioned it before, we have a friend that is actually allergic to wheat, like full-blown anaphylactic reaction with too much. If he starts sounding like a cat that swallowed a fur ball, he stops eating and we check ingredients. Trust me when I tell you some broths have wheat gluten in them! Like mentioned above, I store the pasta and soup separately. 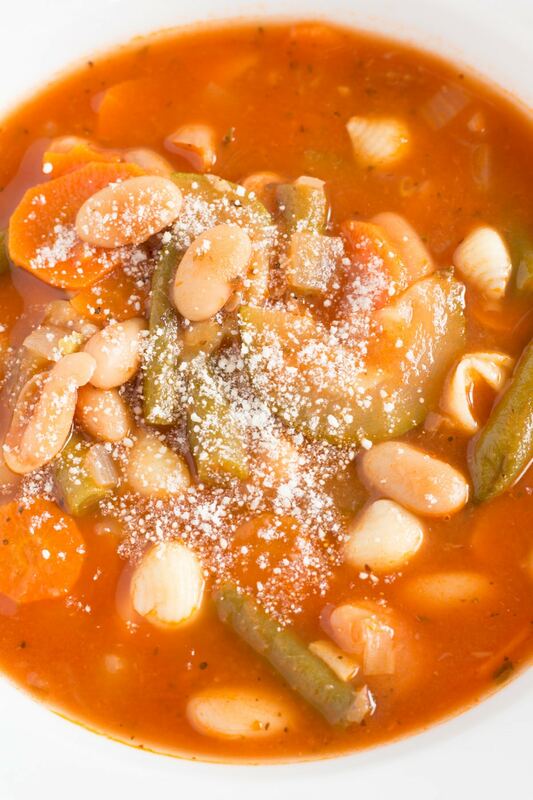 Minestrone soup and the cooked pasta can be stored in the refrigerator for up to 4 days. To reheat in a microwave, add soup and pasta to a bowl and cook for 1 1/2 to 2 minutes on high. Stir and add another minute if needed. To reheat on the stovetop, add the soup to a saucepan and cook until hot. Add the pasta and heat for another minute or so or just until the pasta is heated through. Leaving the pasta in the soup for too long will result in mushy or slimy pasta. Minestrone can be frozen and stored for up to 3 months. I would freeze the pasta and the soup separately. I do not freeze the pasta, instead, I cook new pasta while the soup is reheating. Previously frozen minestrone needs to be thawed completely before attempting to reheat it. I have had very poor luck with reheating this soup from a frozen state. The beans and the zucchini disintegrates during the reheating process. Once the frozen soup has been completely thawed, heat it just like you would refrigerated leftovers. Italian favorites from our kitchens! 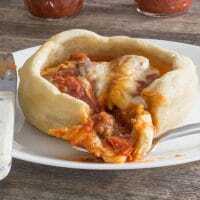 Deep Dish Pizza cooked like a pot pie! 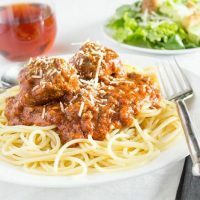 Sweet, red pasta sauce that is great for spaghetti, eggplant Parmesan, or lasagna. We even cook meatballs for subs in it. 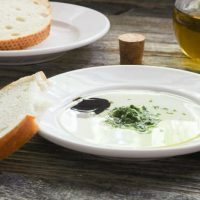 Fresh herbs and olive oil meet up to make the perfect dip for fresh Italian or French bread slices. Quick and easy to make, great for impromptu guests or quiet summer evenings outside. Vegetables and beans simmered in a tomato based broth. Swirl olive oil in a pan, sauté onions over medium heat until translucent. Add garlic and cook just until garlic is soft. Add the basil, oregano, and celery. Cook for a few minutes. Add carrots, tomato sauce and chicken broth. Simmer for about 30 minutes, longer is OK too. Add the green beans and cannellini beans, with the liquid, and simmer until the green beans are tender, stirring occasionally. Add the zucchini and pasta about 30 minutes before you want to eat. Simmer until pasta is tender. Or cook the pasta separate and put some into the bowl before serving. Substitute Vegetable broth for a hearty vegetarian soup.